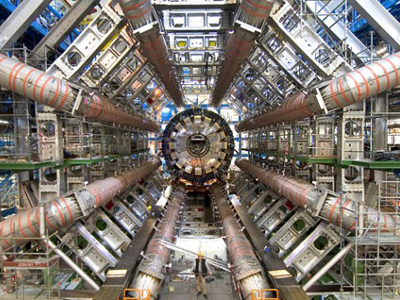 Geneva scientists have registered a glimpse of the “Higgs boson”, but not distinct enough to claim a proper discovery. This raises hope that the 60-year hunt for the Standard Model explanation of the universe’s creation may be finished within a year. ­Two independent groups working at the Large Hadron Collider near Geneva announced on Tuesday they had registered “hints” of the Higgs boson – a fundamental particle, which in theory gave mass to the universe after the Big Bang, thus creating gravity and giving shape to stars and planets. The Atlas and CSM experiments at the CERN collider revealed the same mass spikes at the range attributed to the boson – 126 GeV (Gigaelectronvolts), a mass equal to 126 hydrogen atoms. But the Atlas and CSM did not provide enough statistical certainty to claim a full discovery. "I think it would be extremely kind of the Higgs boson to be here," said Fabiola Gianotti, the scientist in charge of the Atlas experiment. "But it is too early. More studies and more data are needed. The next few months will be very exciting." The elusive neutral particle has been an object of so-called “Higgs Hunters” since it was first predicted in the 1960s. Though the experiment will continue, the two groups have excluded wide ranges of masses first attributed to the Higgs boson, thus significantly narrowing the field of search.